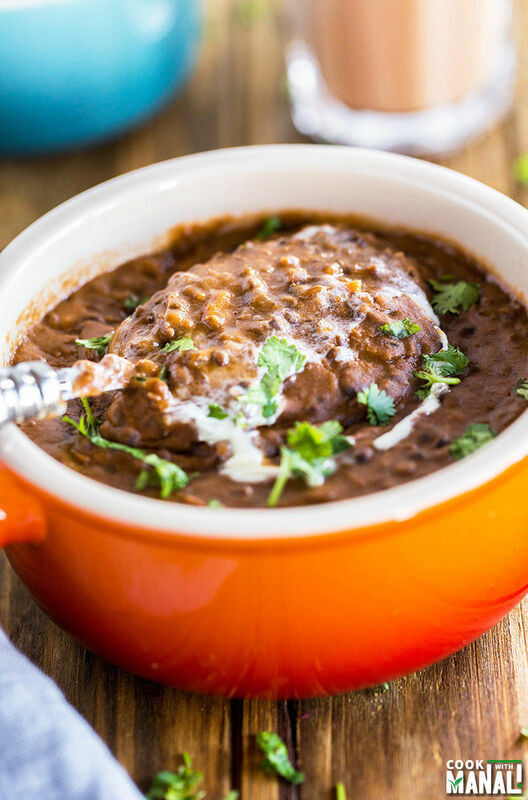 Slow Cooker Dal Makhani – black lentils cooked overnight in the slow cooker and then tempered with spices. Dal Makhani is one of India’s most popular dal and is best enjoyed with rice or naan. Happy Monday! I am sure you all had a relaxing long weekend with family and friends. I think everyone goes into food coma on the day of Thanksgiving but then it amazes me that after eating so much people still have the strength to stand in mile long lines for black Friday! Like there was a mile long queue at the local Target. Can you guys believe it? I am one of those who can never stand in these lines. In fact I stay far away from this Black Friday madness. I prefer shopping online and after watching pictures and videos which went viral on social media from a Nike Outlet Store near Seattle, I am just very glad about my decision. Where is the fun of shopping when you have to literally struggle to walk your way through the aisle? Do you guys go all out shopping on black Friday or do you prefer to stay at home? I didn’t really have a long shopping list anyway but I still ended up buying some kitchen stuff, what else can you expect from a food blogger? Anyway other than the shopping madness, it was good to just eat and relax for a bit. And obviously we all needed the extra break to let this sink in – Thanksgiving is over! Seriously how? I am still in denial. On the brighter side though, everything looks so pretty outside these days. The lights, the cold, it’s just gorgeous. And when it’s that cold outside you obviously crave for all warm and comforting food and even better when it’s made in a slow cooker like this Slow Cooker Dal Makhani. I already have a dal makhani recipe on my blog but it’s the regular version. This one is made in the slow cooker and tastes even better! 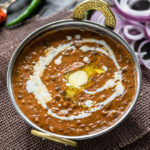 Dal Makhani is one of India’s most popular dal preparation. Especially in north India, it’s there on the menu in every wedding and party. Like the previous recipe, this one is also by my hubby. Whenever we make dal makhani, I leave it to him to do all the cooking. I mean he makes the best dal makhani, so why should I interfere with perfection, right? 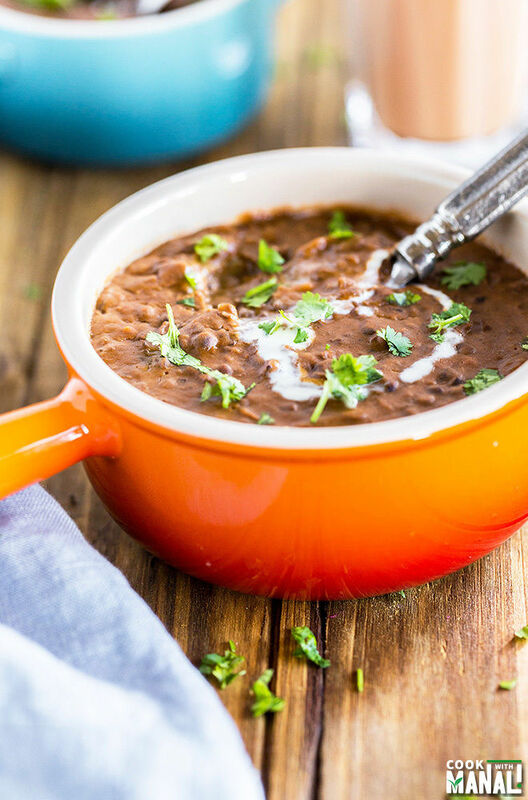 To make this slow cooker dal makhani I used my Instant Pot again and just like my slow cooker chana masala recipe, this one too has few extra steps outside the slow cooker. You basically slow cook the black lentils [urad sabut] overnight and then in the morning add spices, tomato puree, butter and slow cook again for few hours and then do the final tempering. I have to say that slow cooking really works well with Indian recipes. 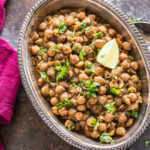 With recipes like chole, dal the flavors have to really come together and slow cooking makes sure that happens. 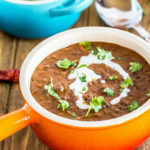 I hope you guys give this slow cooker dal makhani a try, it was definitely one of the best I have ever had. Wash the dal and add it to you slow cooker along with 3 cups water, turmeric powder and salt. Add 2 teaspoons ghee and mix. Add ginger garlic paste and give a stir. Mix everything and slow cook for 8 hours. I used normal setting on my slow cooker mode on my Instant Pot. After 8 hours the dal will be soft and cooked. Take a masher and mash the dal. Add 1/2 teaspoon garam masala, amchur, red chili powder and mix. Add tomato puree and mix. Finally add in the butter and mix and slow cook for 2-3 hours again. After the dal has slow cooked for 2-3 hours, add 1/4 cup heavy cream to it. Once ghee has melted add chopped garlic and whole red chilies. Saute on medium heat till the garlic starts turning light golden brown. Transfer tempering to dal. Add remaining 1/4 teaspoon garam masala, little lemon juice and mix. Garnish with cilantro and serve this slow cooker dal makhani with naan or rice. * Adjust the quantity of red chili powder, butter and cream to taste. You may add more butter and cream for a creamier (& tastier & more calorie laden!) dal makhani. * Use store bought tomato puree here, my husband kind of insisted on it so I thought I must mention it here. 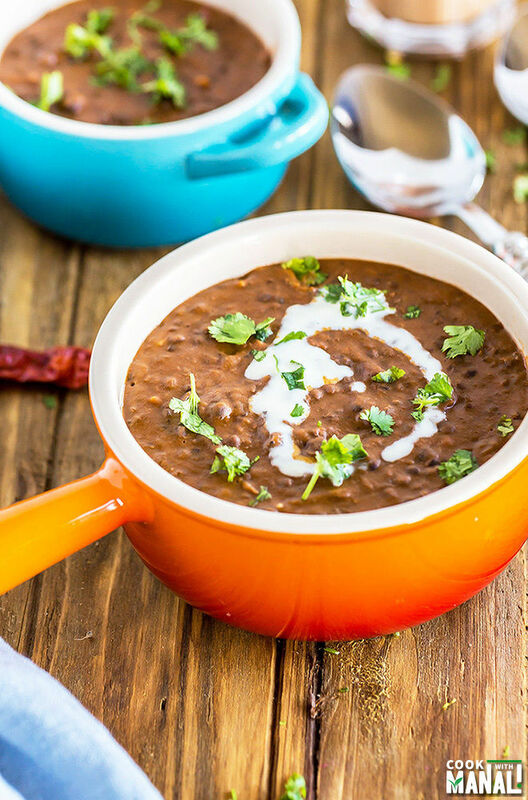 India's famous Dal Makhani made the in the slow cooker. Lightly tempered, creamy and tastes great with rice or naan. Add 2 teaspoons ghee, ginger garlic paste and give a stir. After 8 hours the dal will be soft and cooked. Take a masher and mash the dal. Heat 2 teaspoons ghee. Once ghee has melted add chopped garlic and whole red chilies. Transfer tempering to dal. Add remaining 1/4 teaspoon garam masala, little lemon juice and mix. Garnish with cilantro and serve this slow cooker dal makhani with naan or rice. Hope you had a great weekend, Manali! I never shop on Black Friday either. Too many crowds and just not fun! These lentils look delicious! I’ve never had them in the slow cooker before, so I’m loving the sound of this! I can’t stand in lines either, Manali! Online shopping is the only way to do it if you ask me, especially on Black Friday! I LOVE lentils and feel like they don’t get enough love, so I’m swooning over this dish! PLUS you used the slow cooker! YAY to easy, delicious dinners! Cheers! Yeah standing in lines is no fun at all! Thanks for the lentil love Cheyanne. Oh man, I totally agree with you about Black Friday, Manali! I have no desire to get out there and fight the crowds. I’ll gladly stay at warm wrapped in a blanket eating Thanksgiving leftovers! 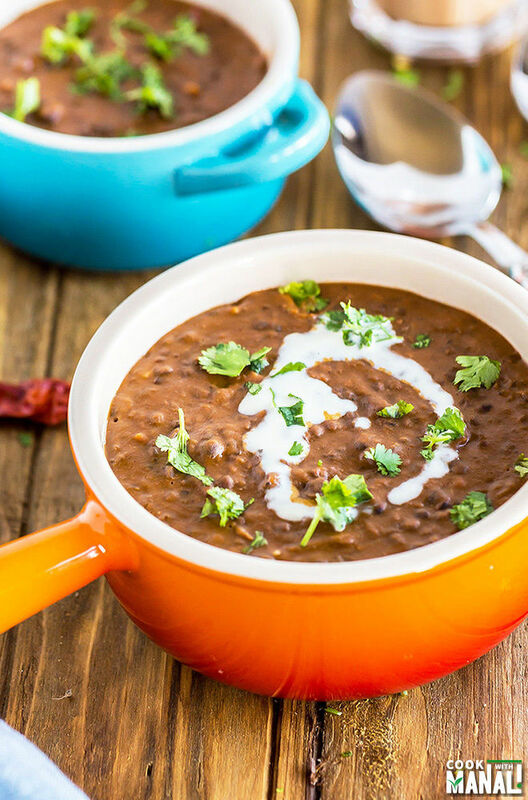 🙂 So I don’t think I’ve ever had Dal Makhani, but it sounds delicious…and it’s in a slow cooker, so you get bonus points for that! Hope you guys had an excellent Thanksgiving weekend! That’s the way to go, stay warm and eat food! 🙂 Thanks David! I typically do not leave my house on Black Friday. People are crazy out there! I’d much rather shop online and eat these delicious lentils! I agree, it’s so crazy out there! Thanks Rachel! I totally stayed home on my couch and bought some kitchen stuff online, too 🙂 Love it!! I can’t even imagine coming home to this after a long day of work… The house must smell so amazing! That’s the way to go! online shopping is best! How often do u use the instant pot? I have been on the fence whether I should buy it or not? How does it differ from a slow cooker? I have a slow cooker . Any insight would be helpful. Juhi, I love my instant pot! I am actually using it pretty often these days especially as a pressure cooker. I really prefer it over our regular Indian pressure cookers because there’s hardly any mess plus no loud whistle..haha..also it’s great for cooking rice and of course as a slow cooker too. I would say go for it because it’s one amazing product. I love dal, but have never made it at home. This looks like a great dish 🙂 & I agree relaxing is nice! We ventured out a bit but since we live in a small town, there aren’t too many crowds haha 🙂 This dal looks so comforting and perfect in this chilly weather. Love that you made a slow cooker version! haha good to know..it’s crazy is big cities! I don’t like Black Friday! Even last week, before it, it was crazy in the stores! Online is my favorite way to shop! Love lentils! This dish looks delicious! I agree, online is best! Thanks Mira! I was definitely in a food coma after Thanksgiving, but this is exactly the type of dish I would love the next day! This is a delicious healthy bowl of comfort and I love the slow cooker option! So comforting, warming and delicious! I just made this and it is fantastic! I even added my own garam masala since I did t have any on hand. Although I cook a fair amount of Indian food, this is the first time I’ve made black lentils. I eat them at Indian restaurants all the time and have always wanted to make them myself. Thanks for the amazing recipe. The whole family loves it. but isnt it necessary to pre soak the lentils overnight? I heard that beans and letils and etc. have to be soaked and the remaining water discarded and cooked in fresh water. you may soak them..I just used them directly and use the slow cooker mode on my Instant Pot (normal not low). I made this for the first time last night, and it was absolutely delicious! Thank you for this wonderful recipe. I have one suggestion for clarification. I don’t know how much of a difference it would have made, but since the heavy cream was listed with the “after slow-cooking” ingredients, I accidentally added it before the second cooking phase. I know it’s not technically part of the “tempering,” but if it’s important to add it after the cooking, then it would be more intuitive to list the cream with the tempering ingredients. Just my 2 cents. Thanks again! Looks good, season seems good, but we put 1 cup lentils to 3 cups water and after 6 hours the water was all gone and the lentils were burnt? Maybe the lid wasn’t on properly? hmm I am not sure how that happened.. water shouldn’t have evaporated..
Namaste! Manali, Thanks for the amazing recipes!. I’m in the UK. Can you clarify what Tomato Puree is? in the UK Tomato puree is really concentrated tomato normally in a tube or a very small tin as its quite intense, you would only add 3 teaspoons of this usually. I looked at your pictures and used ‘Passata’ which is sieved tomatoes, which has a smooth, sauce like consistency – Any help would be useful. 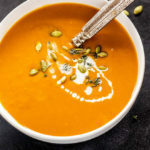 I managed to view a small preview of you new book which I have pre-ordered from Amazon.co.uk and the Dal Makhani is a different recipe to the two on your website, so looking forward to trying that! Manali: your dahl makhani recipe looks delicious! I’ve only just recently been cooking with black lentils and love their flavour and texture, a bit different from green or red lentils. Love the slow cooker. I have used your recipe 2-3 times in the last month already (OK, I know, I should have this dish less often) and it has come out perfect everytime. I just wanted to take this opportunity to thank you for it. Please continue your great work! haha that’s good to know Aditya! I think you should eat more of it! 😀 Thanks for dropping by and letting me know, appreciate it! Thanks for this wonderful recipe. This is the first slow cook recipe i tried in our new instant pot, came out really well. I did one mistake of adding cream early . If you can move cream to tempering section, it will help rookies. Glad to know! and I will fix that Chetan! Thanks for letting me know!